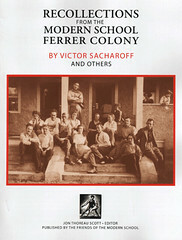 "Recollections from the Modern School Ferrer Colony"
"The Modern School Movement: Anarchism and Education in the United States"
Based on extensive interviews with former pupils and teachers, this Pulitzer Prize-nominated work is a seminal and important investigation into the potential of educational alternatives. Between 1910 and 1960 anarchists across the United States established more than twenty schools where children might study in an atmosphere of freedom and self-reliance in contrast to the formality and discipline of the traditional classroom. These "Modern Schools" sought to abolish all forms of authority and to usher in a new society based on the voluntary cooperation of free individuals. Their object, during an era of war, social ferment, and government repression, was to create not only a new type of school, but also a new world. Among the participants were Emma Goldman, Margaret Sanger, Alexander Berkman, and artist Man Ray. 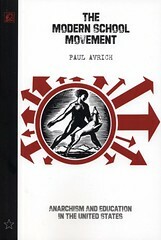 The first in a series of new editions bringing the work of Paul Avrich back into print, this book is widely considered (including by the author himself!) to be Avrich's finest work. To purchase "The Modern School Movement: Anarchism and Education in the United States" please visit the bookstore of the Alternative Education Resource Organization (AERO).